Suspicious Heuristics: Kitchen Nightmares -- restaurant makeover or yelling contest? Let the numbers decide. Kitchen Nightmares -- restaurant makeover or yelling contest? Let the numbers decide. Gordon Ramsay's show, Kitchen Nightmares, has brought hope to the greasy spoons and dirty dive restaurants across America (but mostly New York) for two seasons now. Ramsay made his name first as a soccer player, then gourmet restaurant owner, and now as a TV host to a variety of competitive cooking shows, most notably Hell's Kitchen. He's been named the #1 most successful restauranteur in the world thanks to his kitchen acumen, high standards and vitriolic temper. For Fox's show Kitchen Nightmares, Gordon Ramsay visits restaurants which are financially floundering and attempts to turn them around. This may mean producing an entire new menu, renovating the décor, or installing state-of-the-art kitchen appliances. In spite of these efforts, many still go belly-up after Ramsay leaves. Before the show starts, most Kitchen Nightmare restaurants are under a mountain of debt. The stubborn owner of Sabatiello's was over a million in the hole before Gordon Ramsay showed up. Facing such a dismal business scenario, even expert advice can only go so far. Are heavily indebted restaurants doomed to bankruptcy, or is Gordon Ramsay not the miracle worker he's sold as? Of the restaurants shown in Season 1 of Kitchen Nightmares, 28.5% are still in business. The other 71.5% have been either sold or foreclosed on. For each additional $10,000 in debt before Ramsay arrives, the restaurant's chance of staying open decreases by 1% (holding constant whether the management is male or female). This makes intuitive sense -- as a business' debt load increases, it becomes increasingly difficult to turn a profit while making interest payments. Many owners on Kitchen Nightmares have taken second home mortgages, maxed their credit cards, and pressured friends or relatives into loaning them money. As these burdens grow, bankruptcy or foreclosure becomes more likely. Restaurants with more male owners have an increased chance of staying open. Comparing two restaurants with the same amount of debt, one owned by a husband and wife and one owned by two men, the second establishment would have a 26.6% better chance of staying open (sorry ladies, it's just what the numbers say). This result is somewhat slanted because there was only one exclusively female-owned business featured in Season 1 of Kitchen Nightmares, and it went under. Most of the other women on the show co-owned the business with their husbands. 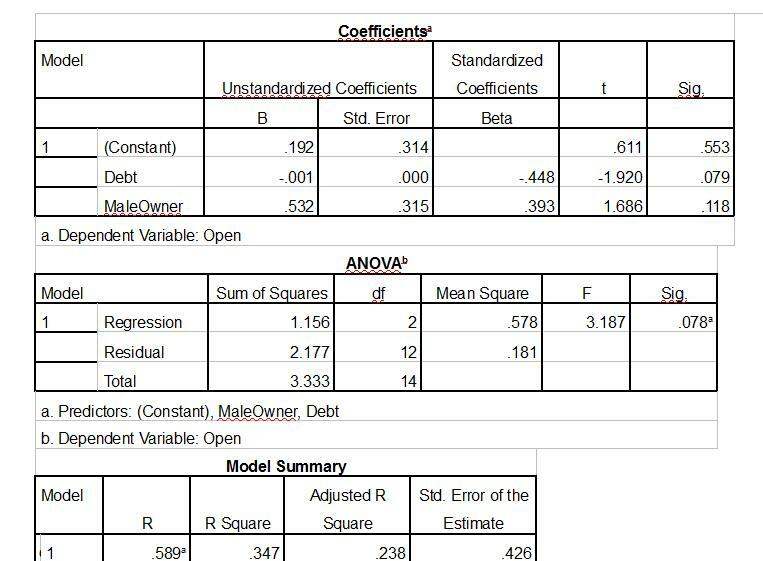 The advantage this model displays for men is almost certainly the result of quirky data in a small sample set, not any objective difference between men and women as restaurant owners. Number of years in business was statistically irrelevant to a restaurant's chance of staying open. Some places had been floundering for up to eight years; none on the show had made it past ten years under their current management. Even owners who had been stuck in a rut managed to turn it around after Ramsay's visit. For example, the Secret Garden had run at a loss for seven years, accumulating $310,000 in debt, but it still remains open and is much more successful now. I think this is the best evidence for Gordon Ramsay's influence; his confrontational approach helps some owners change bad habits and bring their restaurant back to profitability. Campania's Chance of Being Open = .192 -.001* +.532* = .644 or 64.4%. In actuality, Campania's did stay open, so the model is accurate in this case. Trobiano's Chance of Being Open = .192 -.001* +.532*[.67] = 0.048 or 4.8%. Trobiano's is closed, so again the prediction is correct. It worked a couple of times, but how accurate are these predictions generally? To find out, I did the above calculations for all the Kitchen Nightmare restaurants I knew the debt total for. When comparing the theoretical result to reality, the model predicted correctly 80% of the time. I usually strive for better than a B– but for these purposes, it's sufficient. What does this mean for you? Well, if you're considering starting a restaurant with your significant other, letting it go downhill until you could be a Kitchen Nightmares feature, and then trying to turn the business around, you can substantially improve your chances by selling your loved one into slavery to pay off credit cards and then taking on several men as co-owners. The numbers don't lie, right? This small study shouldn't be taken too seriously (which is why you're reading it here, not in the American Economics Review). The sample size is small so the statistical significance could be better. For five of the episodes the amount of debt wasn't disclosed, making the number of useful observations even lower. I might revisit this subject in a little while, after the restaurants on Kitchen Nightmares Season 2 have a chance to sink or swim. Basically, if you're a restaurant owner, don't bet your retirement on these scribblings (at least until you've paid me as a consultant). If you're interested in the t-stats and significance levels for the variables, see the table to the right. These are a few things I've learned from watching all these Kitchen Nightmares. If you skipped all the numbers and just want the Reader's Digest version, here you go. The restaurant business is about high standards. Revolutionary, I know. People want value for their money, and expect that food they go to a restaurant for will be better than what they could make at home. Restaurant owners need to taste their food, nag the chef, and check the fridge often, or else standards can end up somewhere in the back with the spoiled mayo. Restaurants have inertia. Once they start to go downhill, they tend to continue that way. When a restaurant is professionally managed, it closes down when cost exceeds profit for a sustained time. However, when the restaurant is family-owned and represents someone's long awaited dream or a parent's beloved memory, shutting the doors becomes much harder. Owners will exhaust everything they have to prevent a business from closing, but often can't break the habits that made them unsuccessful. It's tragic to watch, because everyone loses; the owners, the staff, the community, and most of all the customers. Although Gordon Ramsay still doesn't make my top ten list of great humanitarians, I think he does a real service to restaurant owners who have lost their way and need to be redirected. For that, well done. The service industry is hard work, and the glamor of owning a restaurant causes some people to forget that. As someone exclusively familiar with the consuming end of the restaurant business, I gained a new appreciation for all the good restaurants I've been lucky to eat at. A lot can go wrong, so it's impressive that so many people manage to get it right. Be careful where you eat in New York. You might see them later in Kitchen Nightmares Season 3.